Posted on January 9, 2015 by Hawaii's Local Buzz. On chilly winter days, curling up with a warm mug of coffee is a great way to relax and soothe your soul. Hawaiian Ka’u coffee from Hawaii’s Local Buzz is a delicious indulgence on its own. Grown in volcanic soils and clean mountain air, it features subtle flavors you won’t find in lower-grade coffees. Purists may argue that it would be a crime to adulterate this wonderful coffee with added flavors, but we say variety is the spice of life. To make a flavorful spin on your everyday cup, try adding a few winter spices to your brew. This aromatic coffee mixture will remind you of your grandma’s pumpkin pie. 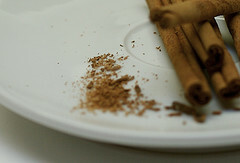 Simply add 1 teaspoon of pumpkin pie spice mix to every 2 – 3 tablespoons of ground coffee beans. You can purchase a commercial pumpkin pie spice mix or make your own by stirrring together 1/2 tsp ground cloves, 1/2 tsp ground allspice, 1 tsp freshly grated nutmeg, 1 tbsp ground ginger, 3 tbsp ground cinnamon. You can store the mixture in a sealed jar and use as needed. Visit Hawaii’s Local Buzz to learn more about our Hawaiian Ka’u coffee that tastes delicious with these winter spice blends.